The international media has clearly bought the French government line about dissent in France being predominantly the ‘work of right-wing extremists’. It’s not. The French, as a whole, are simply sick of the unbelievable taxes, constant inroads into freedom and human rights, and general overall oppression. Clashes have broken out during anti-government protests in France. 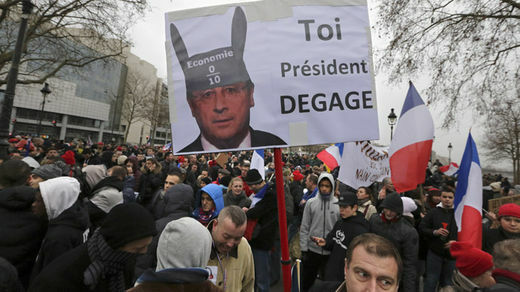 Thousands of people took to the streets of Paris in a “Day of Anger” against a host of policies introduced by President Francois Hollande. An anti-government protest in Paris ended in violence on Sunday when police used tear gas to disperse several hundreds youths throwing bottles, fireworks, iron bars and dustbins. Police said at least 150 people were arrested and 12 police officers were injured in the clashes. According to official figures at least 17,000 people carrying banners saying “The French are angry” marched through central Paris in a mass rally against the embattled president Francois Hollande. Organizers put the turnout at around 120,000. Around 50 small and mainly right-wing organizations were behind Sunday’s march, which they said was a response to a slew of new policies introduced under Hollande, including a law introduced last year allowing gay marriage. They also cited France’s struggling economy and high unemployment, its taxes, their housing needs and lack of personal freedoms, with some calling for France’s exit from the European Union. “Today they are taking our money from all sides. There are new taxes all the time. We have had enough!” said protester Johan Bonnain. Hollande, who polls say is France’s most unpopular president of modern times, recently announced plans for 50 billion euros ($68 billion) in spending cuts between 2015 and 2017 to revive the nation’s embattled economy. This entry was posted in Politics and tagged dieudonne, french protests, french riot, hollande by Laura Knight-Jadczyk. Bookmark the permalink.